This page is for sponsors/vendors setting up in the planetarium. Sponsors setting up in the sponsor hall at the Henry Center should contact Shannon Schmoll (schmoll@pa.msu.edu) with any set-up questions. Installation of projectors cannot start until after 5:30 pm Sunday October 7th, 2018. Please CC Shannon Schmoll (schmoll@pa.msu.edu) in any correspondence. 141 permanent seats. We can set up a few extra folding seats in the back and center. Yard sticks to show scale of the center area. The photo below gives me the heebie jeebies. True or False? There are two 120 volt outlets on the front stage. There is one 120 volt outlet on the back wall. There are many 120 volt outlets in the cove area. The door is 30 inches wide. The center posts are not removable. All crates and boxes must fit through these door. 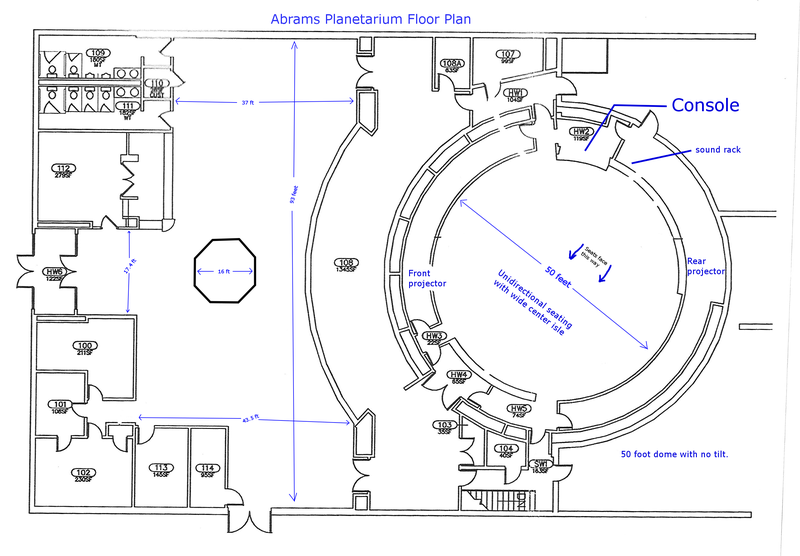 The back door is 34 inches wide.But you are still limited by the internal door of 32"
If you have fulldome content, it would be helpful if it was pre-sliced for Digistar 6. Download our config file here for the ESVideo slicing tool. If you need us to slice frames, frames on an MS-Windows NTFS or exFAT hard must be in our possession by no later than September 15th, 2018. No Mac formatted drives please. John French will be handling sponsor coordination for content in the dome.